When I think of creative, collaborative science, I immediately think of TED. TED talks are truly inspiring, informative and fun. Best of all, the knowledge found at TED.com is free to the world, and waiting for you to share it. 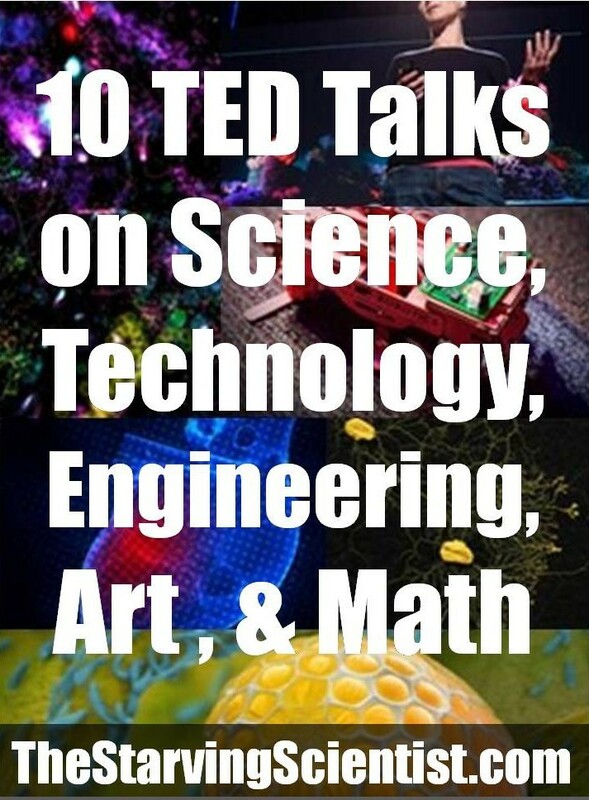 Check out these 10 interdisciplinary TED talks featuring S.T.E.A.M topics to use as an educational resource or to inspire your inner creative scientist, engineer or artist. Mae Jemison is a doctor, a dancer and an astronaut. In 1992, she was the first African-American woman to go into space. In her talk on the importance of science and art education, she states: “People have this idea that science and the arts are really separate.” However, Jemison believes that science and art are “manifestations of the same thing…avatars of human creativity.” She believes that the human creativity that conceived, built and launched the space shuttle is the same creativity, imagination, analysis and ingenuity that designs beautiful artwork. Bran Ferren is a technology designer who believes in the power of combining art and design with science and engineering. In his talk, Ferren describes his childhood trip to the Pantheon which influenced these beliefs. He states: “Largely because of that visit, I came to understand that, contrary to what I was being told in school, the worlds of art and design were not, in fact, incompatible with science and engineering. I realized, when combined, you could create things that were amazing that couldn’t be done in either domain alone.” Learn more about Ferren’s path to embrace both worlds and why you should, too. Margaret Wertheim is a figurer who, together with her twin sister, is crocheting a coral reef. She states: “It’s a project that now reaches across three continents, and its roots go into the fields of mathematics, marine biology, feminine handicraft and environmental activism.” In her talk, she explains the reasoning behind crocheting this structure: “The frilly crenulated forms that you see in corals, and kelps, and sponges and nudibranchs, is a form of geometry known as hyperbolic geometry. And the only way that mathematicians know how to model this structure is with crochet.” Watch this talk to learn more about hyperbolic geometry, the artistry of crochet and the environmental threats facing coral reefs. Learn more about the Hyperbolic Crochet Coral Reef project and Wertheim’s Institute For Figuring. Heather Barnett is an artist who experiments and creates with slime mold (Physarum polycephalum), a single-celled organism belonging to the kingdom of the amoeba. Her work with slime mold inspired her to create “SliMoCo,” the “Slime Mold Collective.” She describes it as “an online, open, democratic network for slime mold researchers and enthusiasts to share knowledge and experimentation across disciplinary divides and across academic divides.” In her talk, she describes how slime mold is being used to map community areas; develop computational rules for electronics, programming and robotics; and serve as a “symbol for ways of talking about social cohesion, communication and cooperation.” Visit The Slime Mold Collective. 5. Jessica Green: We’re covered in germs. Let’s design for that. Tal Golesworthy is a boiler engineer. He also has Marfan syndrome, an inherited disorder that required him to have heart surgery to repair his aorta. Displeased with the “gruesome” surgical procedure required, Golesworthy called on his experience as a boiler engineer to design a better “repair job” for this “plumbing problem.” In his talk, Golesworthy describes the multidisciplinary team that was fundamental in realizing his design: medical doctors, engineers, surgeons, medical radiologists as well as an engineer who developed new CAD code to create the models used in this project. Robert Full is a biologist who looks to “evolution’s ancient engineering” to build robots for today. In his talk, he describes the incredible adaptations of cockroaches, “nature’s grossest creatures,” and how designing with these adaptations in mind can help to build incredibly robust systems. Louie Schwartzberg is a cinematographer, director and producer. In his talk, Schwartzberg asks “What is the intersection between technology, art and science?” He believes it is “curiosity and wonder, because it drives us to explore, because we’re surrounded by things we can’t see.” Watch as Schwartzberg narrates his “Mysteries of the Unseen World” which uses high-speed cameras, time lapse photography and microscopes to highlight the wonders of nature. In his “modest proposal,” Bohannon, accompanied by a group of dancers, argues that scientists should use dance to explain their research rather than powerpoint presentations. He believes that “if you’re trying to give someone the big picture of a complex idea, to really capture its essence, the fewer words you use, the better. In fact, the ideal may be to use no words at all.” Watch this talk to see why Bohannon believes that “dance really can make science easier to understand.” Learn more about Bohannon’s “Dance Your Ph.D.” contest. JoAnn Kuchera-Morin is a composer and the director of the Center for Research in Electronic Art Technology (CREATE) at UC Santa Barbara. In her talk, she describes “The AlloSphere,” “a three-story metal sphere in an echo-free chamber…A large, dynamically varying digital microscope that’s connected to a supercomputer [where] 20 researchers can stand on a bridge suspended inside of the sphere, and be completely immersed in their data.” Watch how this truly multidisciplinary project came to be, and learn about the artists, scientists and engineers who worked to “bring together, arts, science and engineering into a new age of math, science and art.” Learn more about The AlloSphere. All talks and pictures can be found on TED.com. Each picture contains the link to the respective TED talk.